Image: Pankaj Varma and Julie Bose talking to Foundations students about their business experience of setting up a new brand called “Namo”, a series of Devotional Accessories as a design offering in the Indian marketplace. 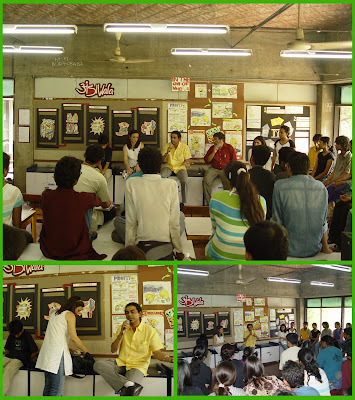 Learning about business processes and business models has a two fold role in the making of a designer in India. The knowledge will hold them in good stead when they actually start practicing design and some of them will become entrepreneurs in their own right, by getting involved in start-up businesses using their design skills and entrepreneurial urge just as many of our graduates have done in the past. Many of such businesses have grown over the past ten or fifteen years and in my recent reflections in conversation with colleagues and students in the DCC class at NID we have identified several classes of such businesses that have been set up by our young designers who have graduated from our institute. The second aspect of business is the understanding of the channel through which the design solutions developed during the design journey are delivered to the public in an extremely competitive space of the marketplace. Many a time great design solutions get sidelined due to some other factors that are usually beyond the control of the manufacturer, promoter or even the product creator. These could be factors in the legal space, the financial strategies employed or even in the layers of branding and positioning that may have been adopted by the marketing team. It is clear that even these offerings can be designed and explored to both reduce risk as well as to respond to current aspirations of users as well as conditions in the market that may call for a revision of the offering in line with the time and place in which it is being made. I have asked the Foundation students explore the field by contacting our graduates in the field in order to find role models for themselves to emulate when their time is ripe for action in the field. India has been a particularly hostile territory for young design aspirants since we have had a protected economy for so many years and design and the risk that it entails was far from the minds of the trader manufacturers who managed our industrial empires as well as the Government that was more interested in control through standards and laws and taxation and special privileges and subsidies rather innovation and market excellence. In my presentation at the Conference on Design Support at Design Wales in 2004 I had the occasion to reflect on the Indian Design landscape and offer a number of categories for design businesses in India. This conference paper (pdf 39kb) and visual presentation (pdf 573kb) show the categories and these can be downloaded from my website at the links provided here. In order to give our students a framework to do their own research about their peers in the design business in India I offer a broad set of categories below which is in no way exhaustive but can give them a head start to look at this space and fill in the details for themselves as we go forward with their education. Design schools and their curriculum has been focused on the creation of skilled personal for industry but many of our products, our graduates from the design programmes, end up being self employed and very happy indeed in that self appointed space. The journey may be traumatic for some or just as easy for others, but the lessons of the street food vendors that was explored by the DCC class would I am sure give our young aspiring designers some insights about how they too can survive in a hostile business environment which is not too supportive of design and the design activity in India has been just that over the past fifty years since the modern design movement started at Ahmedabad with the writing of the Eames India Report in 1958 (pdf 359kb). Perhaps this has something to do with the nature of design itself and only time will tell. The National Design Policy too is perhaps barking up the wrong tree and trying to create designers to serve industry masters, but are they ready to listen? We need to look at other models where designers can work directly with people who need their support and the policy frameworks could be moulded to facilitate such a direction. Here I would draw the attention of my students to the experiments in the Northeast of England where the Design Council UK has carried out the DOTT07 initiatives with John Thackara of Doors of Perception fame as the design leader. Their book, publications link and online documentation pdf (5454kb) of this live one year long initiative is very exciting indeed and could be a model for decentralised design action in India as well. Design schools may need to reexamine their curriculum to ensure that entrepreneurship is included in their mandate and this may bode well for design profession in India going forward. I am sure that we can think of many more such initiatives and see that these are not exhaustive in any way. However, with the creation of the Design Business Incubation Centre at NID with support from the DST perhaps more alternatives will be explored in the days ahead. Perhaps the practicing designers in India can share their experiences and disclose closely held business strategies to design students so that it would encourage several of them to think of taking the entrepreneurial route when the time is right. Data on their business turnover and what they do and how they operate is rarely available since the whole area of design journalism is so poorly operated and structured in India today. I hope that this too will change in the days ahead. Science is the search for knowledge that we all depend upon to tell us how nature works and it is also the vehicle through which this knowledge is refined and tested through a process of hypothesis creation and peer evaluation. Technology on the other hand includes the methods, procedures and tools employed to use this knowledge into shaping dependable and predictable results. However it is rarely understood that generic design which is a natural human activity usually precedes both these stages in the creation of imaginative new products and solutions which may be at first intuitively and creatively apprehended into a workable manifestation and then refined by a process of evolution through multiple cycles as in the case of our crafts and numerous traditional applications. In the case of water harvesting systems in India we have a long tradition of applications that have been evolved through the fertile use of local ingenuity and hard earned insights over centuries of evolution and refinement. Modern design on the other hand contributes to both knowledge creation as well as in helping in the application of existing knowledge in systematic ways to create compelling new solutions that include the multiple dimensions of economic, technological, sociological as well as the aesthetic besides addressing the functional and emotional needs of the user and helps meet the requirements of the task at hand in an elegant manner. This multidisciplinary quality of synthesis is unique to design innovation since it is a framework that enables each contributing specialization and the knowledge held therein to be brought into a particular configuration that opens the huge potential and inherent value in a manner that it can be harvested by a number of stakeholders in a manner intended by the collaborators. Design as we know it today is therefore a negotiated space and an expert procedure that helps unlock the value potential that is found locked within the particular situation. This unfolding has been the subject of much recent research by world design thought leaders as seen in their books such as Tomas Maldonado, Nigel Cross, Harold Nelson, Bryan Lawson, Klaus Krippendorff, Peter Downton, Roger Martin, Don Norman and others who have written books on the subject dealing with design theory and action. Many of them are members of the Design Research Society, which is composed of members who work in the area of design research and who have contributed to shaping the field in recent times through their writing on the subject. I too have many papers on design theory which try to explain the field and these can be downloaded from my website. 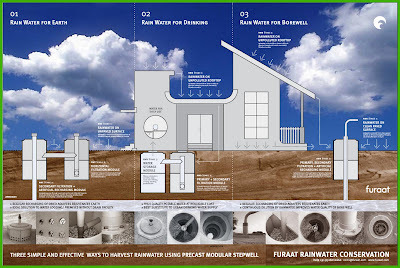 In this particular post I am looking at how design has helped unfold value in the specific area of rainwater harvesting system and I will expand on this a bit later. In future posts I wish to look at many other fields where the use of design has made a huge difference and these too will hopefully help us see how design can be used across fields, and in my considered view India needs this kind of design action across 230 sectors of our economy. Many places in Western India, particularly in Gujarat and Rajasthan there are age old traditions of water harvesting that include both the significant forms in which this art is performed across the region. The balancing of the underground aquifers through the strategic location of small ponds and lakes near a village has served our villages well over the years in helping the people manage their water resources for a year round availability. However with a greater dependence on ground water utilization by pumping in both our rural as well as urban locations we have increasingly seen the water table receding year on year till we reach a crisis point of no return. Many of our regions still receive good precipitation during the monsoon season but due to rapid drain-offs from the catchment areas into the storm drains and rivers we see very little of this water being recharged into the underground aquifers since even the old lakes have now been filled up in the creeping habit of urbanization. Cities like Delhi and Chennai have been facing an acute shortage of drinking water and this crisis is being experienced in many other parts of India as well. The traditional wisdom of holding the rain water run off in shallow ponds near the village seems to be replaced by a new fangled dependence on the deep bore pump and the imbalance of the situation is now showing up in the water shortages in the near term and in climate change at the macro level. Sensitive activists have raised this issue in a number of public for a and some have gone further to use documentation and scientific arguments to show us the consequences of our continued use of ground water resources while not addressing the need for recharge both artificially as well as in the natural way as far as possible. Great examples of traditional water harvesting systems exist all over Gujarat and Rajasthan. The best known and celebrated examples are the Step Wells of Gujarat in Patan and Adalaj near Ahmedabad. In Ahmedabad city, houses in the traditional Polls had used the underground tanks to hold clean rainwater for use through the year. Most traditional houses in the Polls were equipped with such a well-designed system of copper pipes and dark underground sumps sufficiently large to hold a full year’s rainwater supply for drinking needs. Gandhi’s house in Porbunder is a specific example of this kind of rainwater harvesting that was practiced in the Gujarat region. The Centre for Science and Environment (CSE) in New Delhi showed leadership in the awareness building activity through their book on traditional water harvesting systems called “Dying Wisdom: Rise, Fall and Potential of India’s Traditional Water Harvesting Systems” that was published in 1997 by Anil Agarwal. The CSE has sustained its efforts at this awareness and legislation provoking efforts and studies over the years. As a result, today we can see many parts of India have new laws in place that make it mandatory to implement water harvesting systems in all new constructions and in some cases even in existing buildings. The CSE has published a “Water Harvesting Manual” with case studies from Delhi that provides guidelines for public action. However the creation of guidelines and principle diagrams to manage the flow of rainwater from rooftops and catchment areas without contamination into filter beds and then on to the storage or recharge systems is not sufficient to make it happen in a functional and a high quality manner in the real world. Each site needs to be planned and designed to meet the volume of run off as well as the storage or recharge capacity that the system should address. Alternately this leaves a space for several design opportunities for the creation of new products and services that can be offered in a professional manner by an entrepreneurial intervention. It is in the creation of such dependable and efficient as well as elegant systems does design come into play and this can demonstrate the value that is inherent on the situation, much of which is not easily visible to the eye of the perceiver. Image: Furaat System under installation by two persons team. 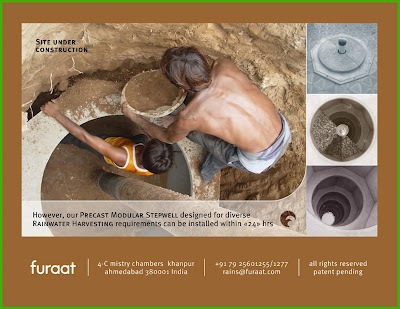 It is one such offering that has been made by the Furaat Water Harvesting system that has been designed for the Ahmedabad based company by an NID graduate of Product Design, Dinesh Sharma. The company, Furaat Earth Pvt Ltd, was set up by the entrepreneur brothers Habil and Yusuf Attarwala with the intention of reaching action on the ground with a small investment rather than just talking about the need for awareness and local action. In the last two years over 400 installations have been achieved and this year has seen a growth in both acceptance and in business with over 500 installations being considered, each costing approximately Rs 30,000 and their message is being heard due to the value that they bring by the use of their successful modular design. The Furaat system can be used for both kinds of applications, that is, storage type or ground water recharge type of application. In the first case the system on offer can form the first stage of the collection and filtration process while a variety of storage types can be used downstream, and in the second case the modular units can be installed in a variety of capacities to recharge deep ground water reservoirs using deep bore wells as the preferred route for the ground water recharge process. While there are so many traditional and scientifically developed systems why are we looking at one that is developed by an industrial designer using the principles of design? This will become clear when we compare the features as well as performance across a number of parameters at the same time and see which ones stand the test of the harsh reality check that is done in the marketplace without subsidies of any kind. The product will have to meet customer requirements across these multiple attributes if it is to become successful in the marketplace. It has to be cost effective and this is achieved by the modular construction that is on offer. Two key components are used in the product – an octagonal horizontal component and a rectangular vertical component – each with a simple locator detail that uses spherical glass beads in a patented configuration to lock the components in place. These are made in high quality concrete castings with precision and durability and in the long run these offer reuse and recycling possibilities in case the location is to be changed in the future due changes in the underground water table characteristics or in new structures on the surface as the site is developed. 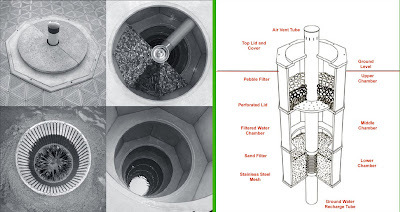 This is a hidden feature that protects the investment and also significant is the ease with which the well components can be assembled, maintained and cleaned after a few monsoons. All water handling accessories too are made of industrial grade metals of high quality that provides durability, performance and filtration standards that are extremely high and the sand and gravel beds at the first and the last stage too can be cleaned with ease since the design affords easy access as it is like a step-well with the dimensions matched to human proportions for lifting, access and climbing as well as being secure in the quality of filter performance that is guaranteed by the company. The pdf file available at their website gives a poster showing areas of application and more details of the construction and the features can be downloaded from their site here. The modular construction gives the user and the planner flexibility in making the particular unit to suit the needs of the site condition as well as the available budget since a one level, two level or three level or even a multi-level unit can be made with the same basic components in a very short time. Installation can be completed in less than a day by one or two semi-skilled masons without the use of hoists or cranes to erect the well components. Ground water recharge if done carelessly can be quite damaging for the aquifer since it is easy to use artificial recharge to help introduce contaminants and surface pollution into an aquifer if the filtration process is carelessly handled. Water is serious commodity that needs great care and attention and we need a variety of systems that can take care of local variants from the point of view of precipitation, terrain, geological attributes as well as population stress and other factors. Design can play a great role in examining and building imaginative solutions that are economic, appropriate and culturally suitable for the particular location. John Thackara in his recent book review has strongly recommended a book on water management titled “Dam Nation: Dispatches From the Water Underground” by Editors Cleo Woelfle-Erskine, July Oskar Cole , Laura Allen, and Illustrator Annie Danger. This brings up another point for us since design need not end with the product in need but can extend to the graphic and systems devices and methods that are used to promote and build awareness about these systems in our wider population. Here the communications too could be designed and the Furaat team has produced posters, flash cards and other communications that can help bring awareness to local schools as well as to parents through their children so that eventually the action on the ground is both significant and effective. Water and its effective management is definitely one major sector that can benefit from design thought and action I would like to see that the Government to include it in the National Design Policy initiatives and just like this one neglected sector (from a design opportunity perspective) we have another 230 sectors that too need urgent public funding and design attention. John Thackara has called for a movement to be put in place to support "collaborative innovation in all public investment in the UK and we can certainly benefit if we can bring these actions to India across our vast landscape with its huge diversity of regional, climatic, biotic, cultural and geological variables that renders central planning so ineffective. The National Design Policy could take a leaf out of the DOTT07 initiatives of the Design Council UK and now the DOTT07 Manual is available online in part as a digital file and as a print product it is available at cost.